Yeah, in case you were wondering, there's a very good reason this book has received star after star after star. It is freaking INCREDIBLE. 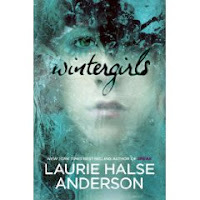 Now, I am a major Laurie Halse Anderson fangirl. But when I heard what this book was about (eating disorders and cutting) I thought, oh no, what if I can't read it? Or what if I read it and hate it? I don't want to hate it. But Laurie is a master storyteller, and she pulls us right in to Lia's life and instantly, INSTANTLY, we feel for this girl. We want to know what's happening to her and why her best friend has died. We want to know more. But mostly, we want to UNDERSTAND. And that, my friends, is why this book is so freaking incredible. Laurie takes us into a world that is hard to understand and although at times it is hard to read, we know we are a better person for having followed Lia on this journey. And in the end, we do have a better understanding of kids like Lia. This book will undoubtedly join SPEAK as a book that is talked about, by teens and with teens, for years and years to come. You can get your very own copy March 17, 2009. And you should, people. You should.